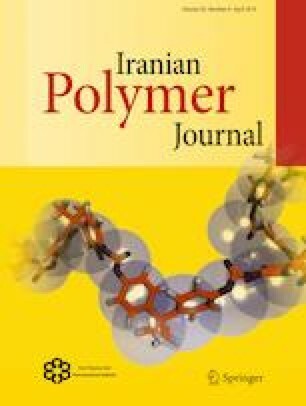 The effects of a new latent accelerator and those of two common accelerators of 1-methyl imidazole and 2,4,6-tris(dimethylaminomethyl)phenol (DMP) have been studied in relation to the properties of dicyandiamide (dicy) cured epoxy resin and its prepregs with unidirectional carbon fiber. The new prepared accelerator is an adduct based on DMP (A_DMP). The results showed that the curing behavior of epoxy/dicy did not change when the appropriate amount of new accelerator was used. The amount of 5 phr of new latent accelerator is equal to the amount of 0.6 phr of DMP accelerator and by increasing the amount of new accelerator, the curing reaction of epoxy/dicy increased significantly. Viscosity build-up results and gel time measurements showed the high pot-life of resin system (epoxy/Dicy/A_DMP) and the high shelf-life of their prepreg. The results showed that the lap shear strength of sample containing 5 phr of the new accelerator (A_DMP5) was increased by 127% in comparison to the sample containing 0.6 phr of DMP. Transverse tensile strength and strain-at-break were increased by 27% and 31.7%, respectively. Transverse flexural strength, flexural strain-at-break and flexural modulus increased by 52%, 11% and 60%, respectively. On the other hand, fracture toughness and fracture energy increased significantly by 214% and 700%, respectively. This increase in mechanical properties was due to the bulkiness of the new latent accelerator acting as a toughening agent and also the good adhesion of fiber to the matrix as revealed by scanning electron microscopy.